Burning Rangers is an Action game, developed by Sonic Team [Sega AM8] and published by Sega Enterprises, Ltd., which was released in Europe in 1998 for the Sega Saturn. 18 .BMP files, 42 .WAV files and 1 .TXT file in the EXTRA directory. 5 Sega Flyer (Optional) ?? 8 French Version: Rigid Blister Pack (Optional) ?? Sonic Team team team team... Always loved that opening. Burning Rangers opens with a decent FMV sequence that is pretty good, but if you are expecting Ergo Proxy meets Ghost in the Shell forget it. The music is good, the lyrics lame. "Just do it... Burning RangerrsssaaaaAAAAHHHHHHHHHHH!!!" Weird and weak. Thankfully gameplay in Burning Rangers is a pretty solid affair with excellent control and nicely done 3D levels (which is rare for the Saturn). The voicework on the female front is excellent whereas the voicework for the male characters is downright atrocious, but we've been suffering from this for years now so it's nothing new. It sounds like they are reading directly from the script and bored to death. This is usually one of the two major flaws in English voice acting. There's either too much inflection, emphasis and emotion making the character sound corny and unrealistic or there's no emotion at all which is the more common of the two. There's nothing worse than listening to someone who is bored reading a script they don't care about. It almost sounds like whoever was reading some of the bad male parts wasn't even looking at the game while he was doing it. Once again, props to the Japanese for pouring their hearts and souls into their games by hiring excellent voice actors who bring real acting skills to the microphone. Aside from some poor voicework, Burning Rangers does satisfy on the gaming front. Running around putting out fires and collecting things is always fun, and you get to do some serious jumping via your character's suit. The amount of rotation used in this game is fantastic, but at times is almost too fast leaving you slightly disoriented. Another cool element is the CPU talking to you guiding you through the levels which is helpful, and thankfully the voice you are listening to is a convincing female. Burning Rangers features large transparent explosions, excellent water fx, light sourcing and shading as well as large complex levels. All of these elements make the game quite visually impressive for a 32bit 3D title on a console that "can't do good 3D". 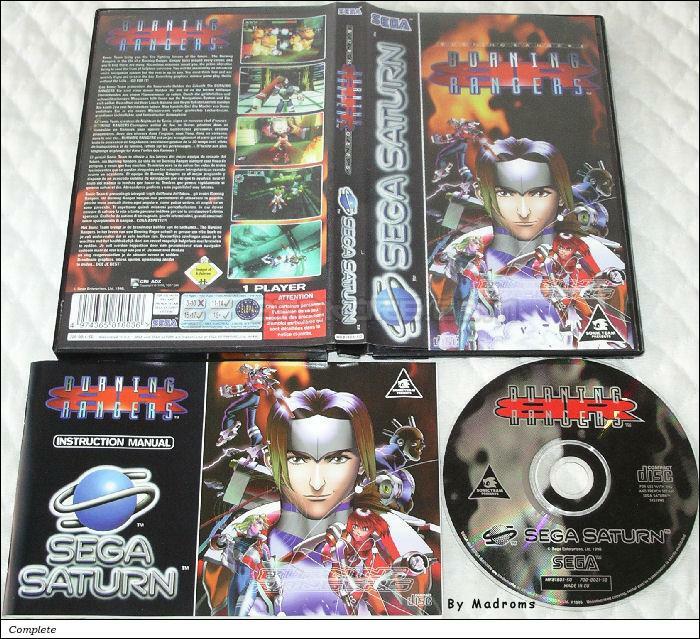 Overall Burning Rangers is a rock solid title for the Sega Saturn, and one of the better 3D titles on the console pushing the hardware to its limits. A sequel would have been nice. There was also a bonus audio cd released with the Japanese version.